André and Madeleine have been in love for over 50 years. This weekend, as their daughters visit, something feels unusual. A bunch of flowers arrives, but who sent them? A woman from the past turns up, but who is she? And why does André feel like he isn’t there at all? 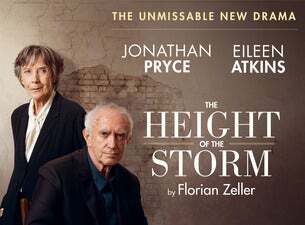 The Height of the Storm is a beautifully compelling family drama by Florian Zeller, "the most exciting playwright of our time" (The Guardian). Starring Jonathan Pryce and Dame Eileen Atkins – two of the greatest actors of their generation on stage together for the first time – this major new play from the writer of Olivier Award-Winning The Father is a searing exploration of love, family and the fragility of life.